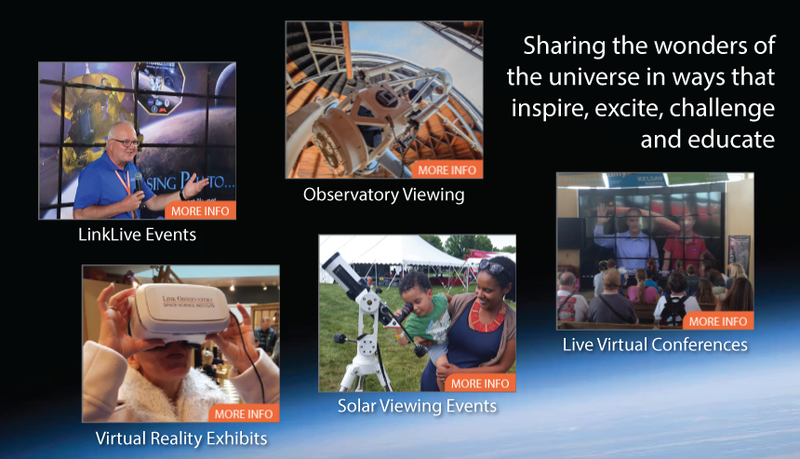 We offer a wide assortment of public programming on NASA Missions, Astronomy and Space Exploration including LinkLive Events, live NASA Video Conferences, Virtual Reality Exhibits, Solar Telescopes and night time viewing through the historic Link Observatory Telescope, all designed to connect the public with the excitement of space exploration. Our affiliations with NASA facilities nationwide allow us the opportunity to bring the very latest in NASA missions and space exploration to the public with unprecedented quality utilizing the latest in multimedia technologies. High definition videos, images and live streaming media make our programs exciting, informing and educational.